Shibuya is a fresh take on block color matching games for the iPhone with a twisted style gameplay that makes Tetris look like a kiddie game. It is pretty easy to describe how the game works, although to really get your mind around how it works you have to try it for yourself. In Shibuya, the blocks cover the entire row. Unlike other block dropping games, in Shibuya you are managing both a falling stack on uncolored blocks, and a stack of colors, and trying to assign the colors to the blocks in a way that matches 2 or more colored blocks. The gameplay involves keeping track of a column of colors on the top left of the screen, showing the the next 5 upcoming colors. There colors are red, blue, green and yellow. The current color is a bigger square and the next 4 colors are shown as smaller squares. Tap any of the translucent block rows falling down to assign the current color to the block and have it drop down. Anytime you get 2 or more matching rows sitting on top of each other you tap to remove them. Strategizing in Shibuya takes some time to figure out.You can assign a color to any of the empty blocks, not just the bottom one, which means you can leave room for matching upcoming colors. So then you have to manage how you leave empty blocks to fill with upcoming colors so that you get the most matching blocks to clear. Another tidbit is that when you fill in the most bottom block it drops down, but if you fill in the middle blocks they won’t. You get more points for 3 matching blocks and so on. 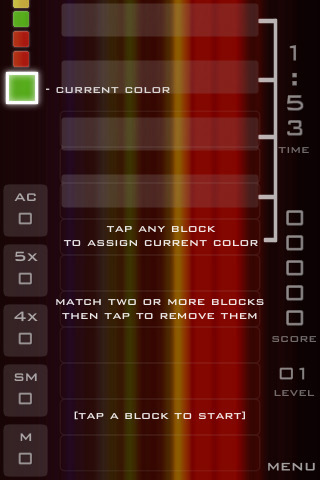 You also get multiplier points for clearing out sets of 2 or 3 color blocks at the same time. If you can manage to fill the entire 10 blocks before you clear them you’ll earn even more points. Shibuya has 2 gameplay modes, quickplay (2 minutes) and endless. Quickplay is great for one off games you can play when have some time to kill. Start out with the Slow speed, and work your way up to Normal, Adept, Fury, and finally Gentle Rain for some insane speeds. There are 11 levels of achievements to reach which makes the game more rewarding. Getting Started, Neophyte, Novice, Intermediate, Contempt, Veteran, Advanced, Skilled, Masterful, Grandmaster, and finally Theoretical. Shibuya uses OpenFeint for global leaderboards, the high score in quickplay mode is currently 7,970 and 52,130 in endless mode. The hypnotic music in Shibuya are 5 licenced songs from the artist Millionyoung, which add to the trancelike nature of the game. You can tap to buy any song you like from iTunes, or play your own iPod music. The sound effects are also pretty fun when you clear blocks. 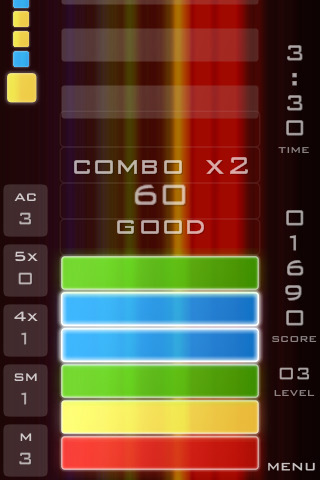 If you’re a fan of color matching or block dropping games, Shibuya is a must have iPhone game. It will force your brain to thing differently. Shibuya has found a nice balance between visual and mental concentration, speed, and engaging gameplay. The only issue I found in this game is that game state is not saved if you quit the app. Otherwise Shibuya is a perfect little puzzler. AppSafari review of Shibuya was written by Joe Seifi on January 15th, 2011 and categorized under App Store, Featured, Fun, Games, Puzzler, Strategy. Page viewed 5719 times, 2 so far today. Need help on using these apps? Please read the Help Page.